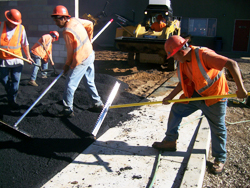 Established in 1960 in Riverside, California, the Surfa Slick Magnesium Asphalt Lute was designed to meet the needs of our customers and provide a long lasting lute that will perform to their satisfaction. 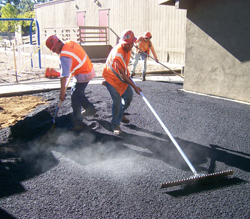 Skillful lute operators are vital to completing a smooth mat asphalt finish. Providing the right equipment will help prevent operator fatigue, accidents and help lower overhead expense. With that in mind our asphalt lute was designed to be both lightweight and rugged. This combination will provide a finish your customer will appreciate. Our asphalt lutes have the strength and spring of steel and yet are one third lighter than aluminum. Our magnesium handles and bars are resistant to abrasion and dissipate heat. The heavy duty casting connecting the handle to the bar creates a rigid connection superior to weaker braced connections. Our lutes are easily recycled. All of us at Surfa Slick are proud to provide you with the latest advancements in lute design and quality. We think you will agree by the long life of each of our products that Surfa Slick is committed to serving you today as well as tomorrow. When you think asphalt lute, think Surfa Slick.